There are quality tyres for a wide range of cars, vans and 4x4s at Just Tyres Guildford and we’re always on hand to help you choose the right set for your model. Every single budget, mid-range and premium tyre we fit is hand tightened in our brightly lit workshop, while you're guaranteed the most competitive prices. Our tyre fitting centre in Guildford can be found on Walnut Tree Close.The location in Guildford is easy to find and has parking for your convenience. 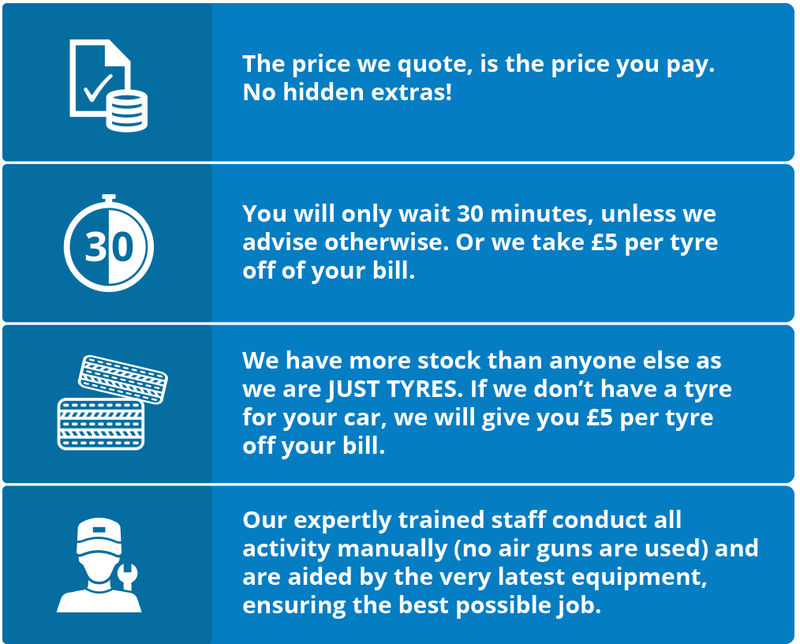 If you are looking to buy tyres in or around Guildford, we would be happy to help. Don't forget you can also pop in for a FREE Tyre Check where we can offer advice and assistance on any tyre queries you may have. If you would like to buy your tyres online and have them fitted at our tyre fitting centre in Guildford, just click on the Buy Online image and book your fitting day and time during checkout. We always work to make sure you’re getting the lowest possible prices for your tyres, and our ‘Lowest Price Guarantee' means we can refund the difference on any tyre purchased elsewhere (within a 20-mile radius of our fitting centre) at a cheaper price. Refunds can be rewarded when we've been presented with a written quotation or advertisement within seven days of a purchase, while online offers and quotes are not valid. We can offer immediate quotes on current stocks and prices using our RACS system (Rapid Answer Computer System) and we regularly hold greater stock levels than alternative retailers. We are proud partners with Foxy Ladies Drivers Club, the UK's only club for women drivers. This means that we promise to never overcharge, patronise or sell women anything that they don't need. Approved by Foxy Ladies Drivers Club, Just Tyres are pleased to be able to offer all of our female customers free lifetime membership of this exclusive club, worth £24. Benefits can be found on our club page and to take advantage of this offer all that you need to do is sign up online on the Foxy Ladies Drivers Club Website and ensure that you enter Just Tyres in the referring organisation box. Get the latest tyre offers and advice direct to your inbox. Sign up today to receive the Just Tyres monthly newsletter. T&Cs apply. We'd love to send you money off vouchers, exclusive offers and notification of sales from Just Tyres by email, Text and post. We will not share your information with anyone else and you will have the opportunity to opt out at any time.